The initial process of removing gel polish is filing off the top layer. After you apply the gel and cure it under UV or LED light, you will realize that the gel adheres to the nails so strongly that removing it will take a lot of efforts. It is due to this excess effort that you might end up damaging your nails. What you need to do is take a nail file and file of the top layer. After this shiny layer is removed, you can then continue with the next step. However, do not file so hard that you reach the nail surface. There are different ways that you can use acetone to remove the remaining layer. One of these ways is where you take cotton balls that can cover the surface of your nails completely that no part will be left exposed. You will then dip these cotton balls in 100% pure acetone. Take soaked cotton balls and cover the nails ensuring that they are completely covered. When this is done, you need to have some tin foils. 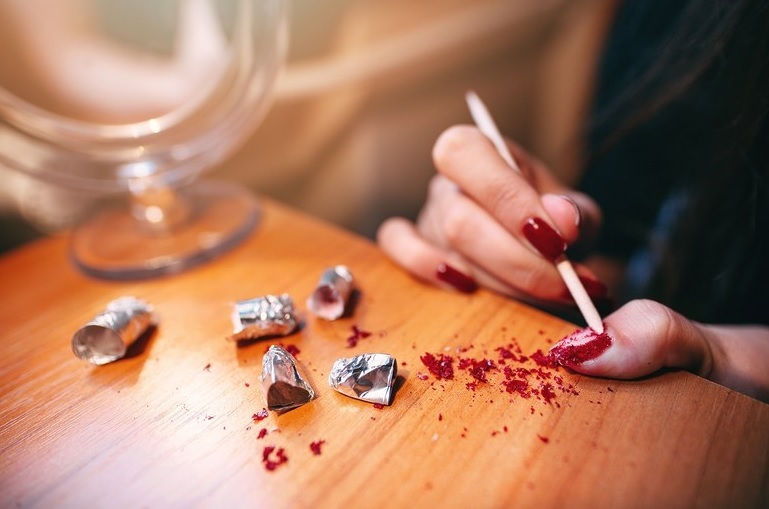 Take the tin foils and cover your fingers such that they will cover all the cotton balls as they press on the nail surfaces as well as the nail edges. When this is done, wait for at least 15 to 20 minutes before removing the tin foils and the cotton balls off the fingers and the nails, wipe off the nails using the cotton balls and the lacquer will be removed. When you are using the tinfoils, do not unwrap your fingers to check if your method is working because it might jeopardize the whole process. Also, make sure that you work on each hand at a time because the hand covered with tin foils might not be able to cover the other hand in the most effective way possible hence creating the essence of working on each hand at a time. If you do not want to use this method, look for two bowls, one big and another one smaller such that the smaller one can fit in the bigger bowl. Then, take some warm water and put them in the big bowl such that the small bowl will be floating on this water. When this is done, you should then pour some acetone into the small bowl and allow the solution to get a little warm. You can then dip each of the hands in the bowl with acetone at the time for about 15 to 20 minutes. Later on, remove the hand from the bowl and wipe off the nails. This will remove the remaining gel polish cover. Make sure that you do the same to the other hand. The last step involves the use of cuticle oil. Your cuticles might be affected by acetone which makes them look dry and dehydrated. You should apply some cuticle oil in order to nourish them. If you realize that the process leaves you with rough nails, you should also apply cuticle oil on the nail surfaces and buff them, as usual, using a nail buffer. The removal of DND gel polish should be done carefully in order to avoid damaging the nails. After all, you have been looking for all the best polishes around in order to keep your nails strong and healthy. =do you really have to jeopardize this? Make good use of the file and acetone oil and ensure that the coats are perfectly removed for the best results. After the removal, give them some time before applying another layer.